My friend Alan Megargel invited me to the the Eagles Long Road Out of Eden World Tour concert at the Singapore Indoor Stadium. The sound quality was amazingly good in the cavernous stadium. 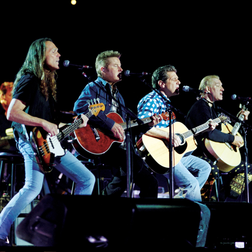 The Eagles - Glenn Frey, Don Henley, Joe Walsh and Timothy B. Schmit - performed classic hits such as Hotel California, Desperado, Take It Easy, The Best of My Love, Tequila Sunrise and Heartache Tonight. The band sang very well - the vocals were precise, the harmonies perfect, and the passion intense. It sure brought back memories of my care-free, partying days at university. The North-East Monsoon winds have picked up after Chinese New Year and the heavy rains. Today's sailing was very pleasant, with some nice long stretches of fully powered reaching, although there were some occasional gusts and lulls. I tried the Drift Innovation HD170 video camera, and mounted it on my mountain bike helmet. I managed to capture a couple of airplanes flying overhead as they were preparing to land at Changi Airport. Also, my harness line (starboard side) snapped so I hung on to the boom and planed almost all the way back to shore. Wonderful, except my lower back and arms were really hurting.